JMF Disco provides a fantastic Mobile Discos in Margate for your party for all different types of events - a party in a pub, a wonderful wedding reception, a fabulous birthday party, a children's disco or a golden wedding anniversary - we can provide the right mobile dj and mobile disco to suit your particular requirements. JMF Disco is owned and presented by DJ John Padmore, a reliable, experienced Mobile Disco in Margate. My aim is to provide you with all the help you need, from your initial phone call to seeing your happy guests leaving after a wonderful nights entertainment, at your perfect party provided by Mobile Disco Margate. JMF Disco's Mobile Disco Margate service will provide you with the entertainment you want for your dream party - why settle for anything less? Call or email JMF Disco for your Mobile Disco Margate to find out how I can help you. Have a look at the Celebrations page for more details of the Mobile Disco Margate service I offer and call me to discuss how I can help make your evening very special. Contact Mobile Disco Margate on Tel 01795 429777, Mobile 07895 546183 or by email to discuss your Mobile Disco needs or questions. Dreamland is a completely unique venue for parties, celebrations and corporate events, where everywhere you look you'll find a wonderful sense of seaside magic ready to sprinkle across your special day. 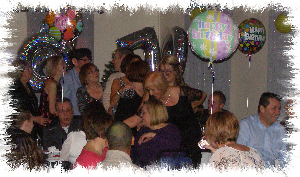 Looking for Mobile DJ hire in Margate for your landmark birthday party celebration? Maybe your 40th, 50th or 60th birthday? JMF Disco can provide you with a great mobile DJ for your party and all the help you need to host a great party playing all your favourite tunes from yesteryear or yesterday! Check out other local areas and party venues we serve:- Mobile Discos In Ramsgate, Mobile DJ Manston, Mobile Disco Westgate, Party DJs Cliffsend, DJ Hire Cliftonville and the whole of Thanet and Kent! - I'm sure I can provide you with the Margate Mobile Disco you really want!